I have no shame in asking for showers of praise for this entry because I had to cut all those little nori whiskers, eyes, and nose by hand with a scissors and then apply them with a pair of tweezers! Feel free to hand out ooohs and aaahs for that red pepper ribbon too cause it took me (I swear) 15 minutes to cut with a knife. D: Miss Kitty has ume (more red) in the middle. Also included are two pieces of Ajinomoto brand pork gyoza, which are basically little dumplings of heaven. They cost 1 WW point each, so that’s why I only packed two. Next to it is some finely chopped bell pepper fried in the leftover juices of the gyoza (which doesn’t require oil to fry, just water). 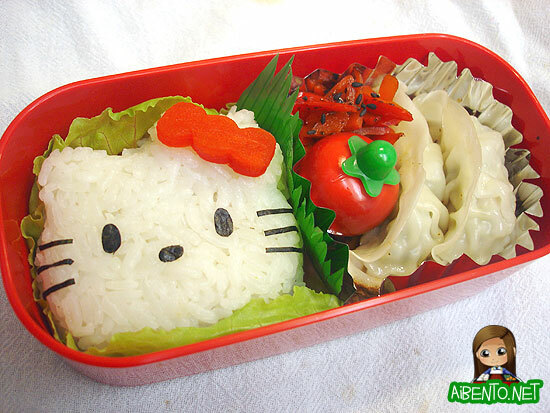 I added a tomato shaped soy sauce container for the gyoza. The bottom layer was quite the adventure to make as well. I bought a section of watermelon at Safeway and finally cut up that tuscan melon I bought at Costco. As I expected, the tuscan tastes wonderful! Anyway, I still had some galia melon, so I cut out flowers from all three melons then carved out a little center from each one with a plain ole drinking straw and exchanged the centers with other colors! Inside the bear cup is some fat free, sugar free instant pudding with a raspberry nose and blackberry eyes. Added the Babybel and strawberries for more red. 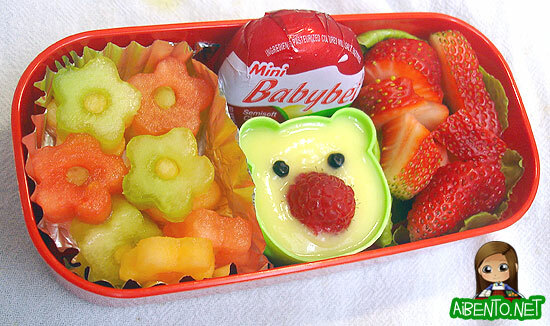 I had to rearrange the strawberries and cheese to close it up, but it didn’t look much different.